NOTABLE CATCH: D Dyson 5 fish, Keith Charnock 12 fish. NOTABLE BAG 5 fish weighing 13lb 8oz for Keith Charnock. BEST RAINBOW: 4lb for Tom Jordon. BEST BLUE: 2lb 8oz for Brendan Ginty. BANK ROD AV: 1.09 fish per angler. SPORT: After a very hard frost last night the water was frozen apart from a few patches around Bell point but as the wind picked up this soon cleared and as i write there is only a small frozen patch just below the fishing lodge. Although things were a little tricky today there were some reasonable catches made. From the bank David Dyson landed 5 fish this morning from Bell point. David caught his fish on a small un-weighted cats whisker fished on a floating line extra slowly, cast out let the fly sink slowly and then just inch it back, just as you would fish with buzzers. From the boats the best areas were around willow island and the northern shallows. Keith Charnock fished these areas and landed 12 fish. Keith found his best patterns to be a lime green fritz cats whisker or a green lure, once again fished back slow and deep. Peter Andrews caught 4 fish also from the northern shallows but found a green pea to be his best fly. Nice to see old friends back after the winter. See you on the water Paul. This entry was posted in Stocks Reservoir Fishing Reports on February 28, 2013 by Ben Dobson. BANK ROD AV: 1.1 fish per angler. SPORT: Today we were greeted at dawn with a frozen reservoir and unspoilt blue skies, both of which we have not seen since 5 days prior to our open day last saturday. Spring has certainly been knocking at the back door today but what about the fishing!? Not great today but it is almost certainly due to the heavy frost and change in weather, the high pressure and brightness along with the sub zero temperartures through the night turned the fish off today it seemed. But fear not, with 30% cloud cover forecast for thursday we expect to see a lot more action during the intermittent patches of cloud. The few boats that did venture out through the ice today struggled to hit into any large quantities of fish, the best seeing two fish to the boat. There were a few fisherman who caught one fish each up towards the causeway and in tight around the willows. Tony Taylor had the top rod of the day with 4 fish in and around bell point fishing his own cats booby uv pattern fly. Mr S Williams had 3 fish, one of which a cracking 7lb 2oz blue. Well done! There were a lot of singular fish caught today by most of the bank anglers and a few blanks. Tough conditions for fishing today, every fish caught today was fought hard for and eagerly awaited. The water level has dropped off over the last 24-48hrs approx 2ft since the end of last week. Water temperature is obviously very low due to last nights frost but the colour is bang on. A couple more overcast days and the predicted increase in temperature should see us back on fish as we were at the beginning of the week! This entry was posted in Stocks Reservoir Fishing Reports on February 27, 2013 by Ben Dobson. NOTABLE CATCH: 6 fish for A Hillcoat, several other anglers caught 5 fish. NOTABLE BAG 5 fish weighing 20lb 8oz for Andrew Hillcoat. BEST RAINBOW: 9lb 12oz for Andrew Hillcoat. BANK ROD AV: 2.76 fish per angler. BOAT ROD AV: 2.75 fish per angler. SPORT: There was a cold east wind blowing all day today with cloud this morning then brightening up this afternoon although the sunsine did little to lift the temperature. The best catch from the bank today fell to Andrew Hillcoat who caught 6 rainbows with the first 5 tipping the scales round to 20lb 8oz with his biggest weighing 9lb 8oz, almost a double! Andrew caught his fish from Hollins bay on an orange fritz lure. From the bank there were several anglers who caught 4 or 5 fish with the majority of these being caught from Hollins bay or Bell point with the top patterns being orange or black and green fritz lures. From the boats the best catch went to Ian Gaskill and Bob Fitzpatrick who tempted 4 fish each on black and green fritz lures. They caught from the willows and Hollins bay. The other boat out today found fish at the back of willow island on tadpoles. See you on the water Paul. This entry was posted in Stocks Reservoir Fishing Reports on February 26, 2013 by Ben Dobson. Stocks has got off to a fly start this season, so why not have a go in this original fly fishing competition? Each pair consists of one boat angler and one bank angler. If you are fishing from the shore you will be drawn with another bank angler and together you are then free to roam the reservoir. If you fish from the boat you will be drawn with a boat partner for the day. 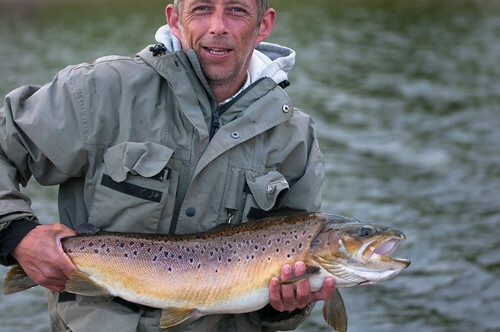 It is fished to fishery rules and is just £95 per pair to enter and that includes both your fishing fees and boat hire. There is some great gear to be won. 1st prize is a 10”0’ 7# Greys XF2 Competition Special Fly Rod Each worth £220.00 a piece! Please call Stocks on 01200 446602 or my mobile on 07896000939 to enter or with any queries. This is a brilliant day out with a relaxed, friendly atmosphere and suited to anglers of all abilities. NB* If you would like to enter but have no partner the fishery will happily pair you up. Just call us and leave your contact details and your preference for bank or boat fishing. SPORT: For this, our first Monday of the new season, fish were being caught throughout the day yet in slightly less numbers than seen on the first two days of the 2013 season. Although anglers have had cold wintery conditions to contend with thus far, they have so far at least been granted a healthy level of consistency from one day to the next, in particular the wind direction which has remained the same for over a week now. Ian Greenwood and Mark Tyndall had the best number of fish to their boat today with 15 fish mostly taken in and around the willows and taken on a green pea. Following closely behind them was Phil Hambley with a respectable 9 fish to his boat. Phil managed to capture the essence of a great days fishing from the off and was very complementary of both the fishing, the quality of fish and service he received so thank you Phil! Your kind words are very much appreciated! Green Pea, Damsil, Cats whisker, Black fritz were amongst the most successful flies used off the boats today. Bank anglers saw a better rod average than boat anglers and Hollins Bay produced fish for nearly all who fished there including 12 fish for Graham Harness, 10 fish for Ray Entwhistle, 9 fish for Terry Worthington, 7 fish for Alan Daniels and 6 fish for Joe Halton. Well done to Gavin Murray for landing 12 fish, the best being a 4lb 8oz rainbow noteably citing bens beach as his best area of the day. Gavin took his fish on a green/black cormorant. Other flies used successfully off the bank were montanas, black nomads along with fritz and cormorants.. A mixutre of floating, ghost tips, and intermediate lines were used today with fish in the shallows of Hollins taking flies on floating lines whilst out in deeper water were taking below the surface and on the hang too.